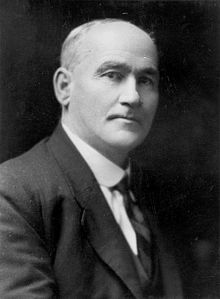 Hubert Thomas "Tim" Armstrong (28 September 1875 – 8 November 1942) was a New Zealand politician of the Labour Party. Armstrong was born in Bulls to the recent Irish immigrants Mary Newcombe and her husband, Martin Armstrong. His father was a blacksmith by trade, but worked as a labourer in New Zealand. His mother was a nurse and washerwoman. Tim Armstrong left school when he was eleven and worked in flax milling and in the bush. In 1895, he started in the mines at Waihi. He married Alice Fox on 7 March 1900 at Paeroa. One of his sons, Tommy Armstrong, was also a Member of Parliament for Napier for the Labour party. Armstrong was elected to the Christchurch City Council from 1919 to 1925, and again from 1927 to 1929. He was selected as the Labour Party candidate for Christchurch North in the 1919 general election. As a unionist who had spent a year in Lyttelton goal for sedition, he had no chance of being elected in this well off electorate, and the incumbent, Leonard Isitt, was successful. He represented the Christchurch seat of Christchurch East from the 1922 general election to 1942, when he died. He held ministerial positions in the First Labour Government, including Minister of Health, although he was replaced by Arnold Nordmeyer in 1941, because of the problems negotiating with doctors over Labour's health proposals. Other ministerial positions include Minister of Labour and Minister of Immigration. Armstrong died of heart disease in Wellington in 1942. He was buried at Bromley Cemetery on 12 November 1942. Wikimedia Commons has media related to Tim Armstrong. ^ a b c McAloon, Jim. "Armstrong, Hubert Thomas". Dictionary of New Zealand Biography. Ministry for Culture and Heritage. Retrieved 2 June 2011. ^ a b c Wilson, James Oakley (1985) [First published in 1913]. New Zealand Parliamentary Record, 1840–1984 (4th ed.). Wellington: V.R. Ward, Govt. Printer. OCLC 154283103. ^ "Councillors of the City of Christchurch 1862 to current". Christchurch City Council. Archived from the original on 20 July 2011. Retrieved 9 July 2011. ^ "Christchurch City Council Cemeteries Database". Christchurch City Libraries. Retrieved 2 June 2011.